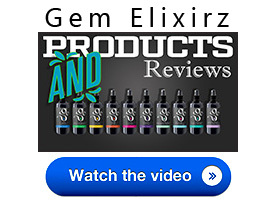 Professional Supplement Center now carries Gem Elixirz, a line of aromatherapy sprays made with high quality natural essential oils and semi-precious gemstones. These sprays are meant to bring about transformation in specific areas of your life. Included within each spray bottle are predrilled semi-precious stones that can be made into custom jewelry and worn as a transformation tool to assist your intentions. Gem Elixirz were created by Dr. East Haradin, a licensed acupuncturist and professor of East Asian medicine, in response to patient and student requests. Dr. Haradin’s Doctoral research was a clinical trial that tested the efficacy of acupuncture in combination with aromatherapy in treatment of stress. 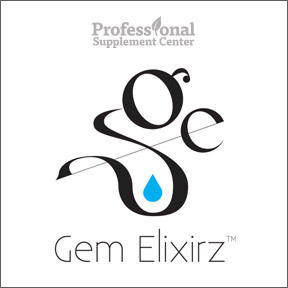 Gem Elixirz are used in healthcare settings and are designed to empower people to reach their highest potential. Abundance – Cinnamon, clove, frankincense, ginger, myrrh, orange, patchouli and spruce combine to attract abundance in all areas of your life. This spray contains citrine, moss agate, peridot and tiger’s eye gemstones intended to attract prosperity and success, enhance self confidence and remove blocks to abundance. According to the principles of Feng Shui, use Abundance in the west area of your home. Sleep – Chamomile, lavender, sandalwood and clary sage combine to enhance deep, restful sleep and peaceful dreams. This spray contains amethyst, hematite and labradorite gemstones to promote calmness, reduce insomnia and restore harmony to the body. Shift – Cypress, grapefruit, lavender, neroli, rose, sandalwood, ylang ylang, and clary sage combine to filter out negative energy and remove negative thoughts. This spray contains aquamarine, calcite, rose quartz and jasper gemstones to harmonize surroundings, remove stagnant energy and infuse positive vibrations. Use Shift in the south area of your home to attract positive recognition and release self-doubt. Focus – Jasmine, lavender, lemon and rosemary combine to enhance memory and concentration and increase focus. This spray includes amethyst, Botswana agate and fluorite to support learning and quick thinking. To be in alignment with your soul’s highest path, use Focus in the north area of your home. Aromatherapy 5 Pack – This boxed set of 5 aromatherapy sprays includes Sleep, Focus, Pain Relief, Calm and Immunity. The set also includes a jewelry kit and mini brochure. This entry was posted in Home and tagged Abundance, Aromatherapy 5 Pack, Focus, Gem Elixirz, Shift, sleep. Bookmark the permalink.